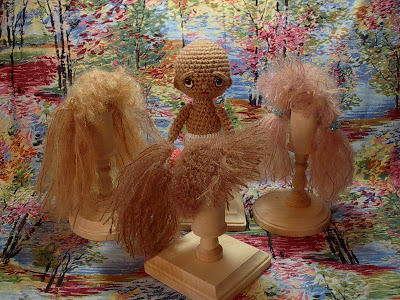 I really do love making wigs for my dolls :-) As you can see above, I decided to make three different wigs for my warm brown Mini Free Spirit. She could not decide if she wanted to be a blond or a brunette, or how she wanted to wear her hair. So, I made a dark golden blond long-haired wig, a strawberry blond wig with two ponytails, and a brunette wig with one ponytail. These wigs really are easy to make. The yarn does all the work; for these I used a very hairy worsted weight yarn. 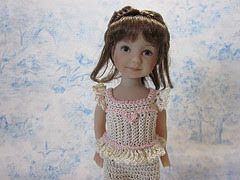 I also used a mohair laceweight yarn held with the worsted weight to add highlights to the hair, but this is not necessary. The hairy yarn give a wig cap that really doesn't need to be covered with yarn strands, so I didn't. For various ponytails or pigtails I just hooked a few strands of yarn in the appropriate places and pulled the yarn together with little hair clips. 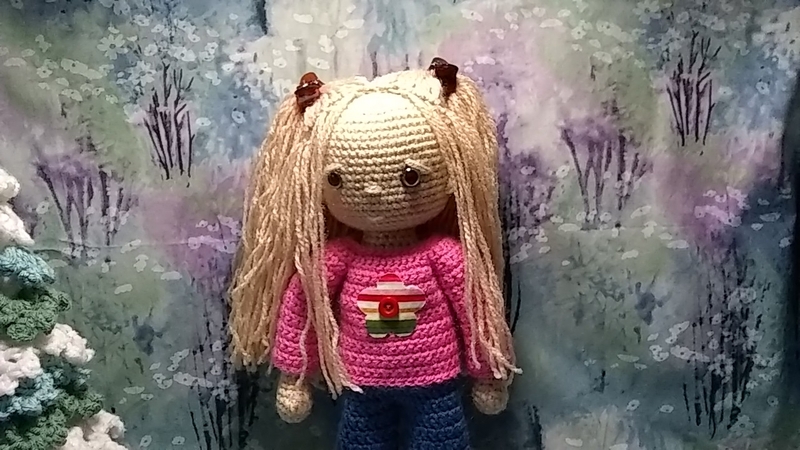 I have not had any luck finding these yarns locally, so my best advice is to try A Child's Dream Come True, Magic Cabin Dolls, or Weir Dolls and Crafts, all on the web. Below you can see how she looks in her different wigs. 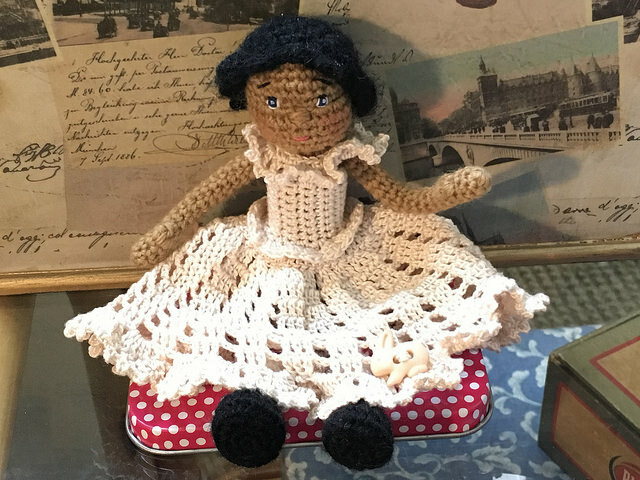 Enjoy the holidays, and enjoy the crochet! I like the blond wig the best.. You seriously have a knack for hair! ever think of being a hairstylist? 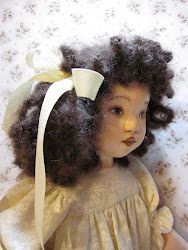 Usually I make the wig cap, then sew it to the head, then hook the threads. 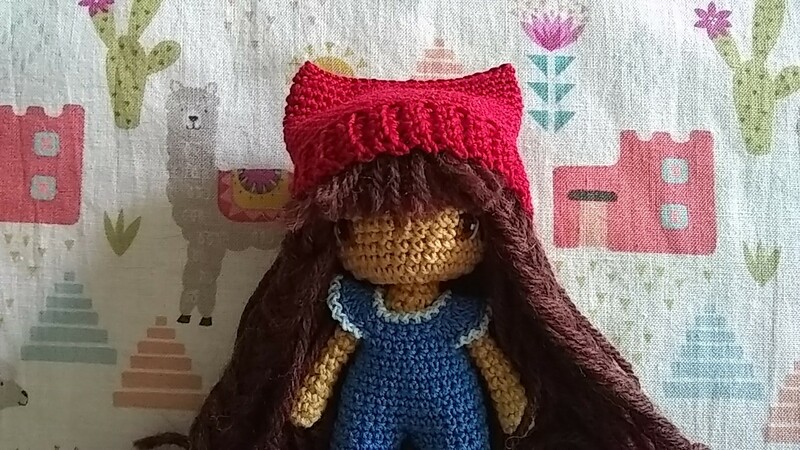 The doll gives me something to hang on to when doing the yarn strands. I have not had too much trouble with this causing a wobbly head...do you put a little wooden spool in the neck to help stabilize it? This seems to work pretty well for me. Looking forward to seeing your doll! Anne, she is wonderful :-) Great body and beautiful face. Can hardly wait to see the clothes! 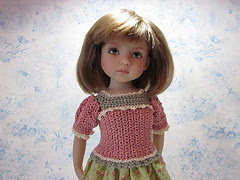 Free Spirit is 12 inches tall, crocheted tightly with an E hook, and the mini is just over 7 inches.